Purpose Three-dimensional (3D) scans with flat detector angiographic systems are widely used for neurointerventions by providing detailed vascular information. However, its associated radiation dose and streak metal artifact generated by implanted treatment devices remain issues. 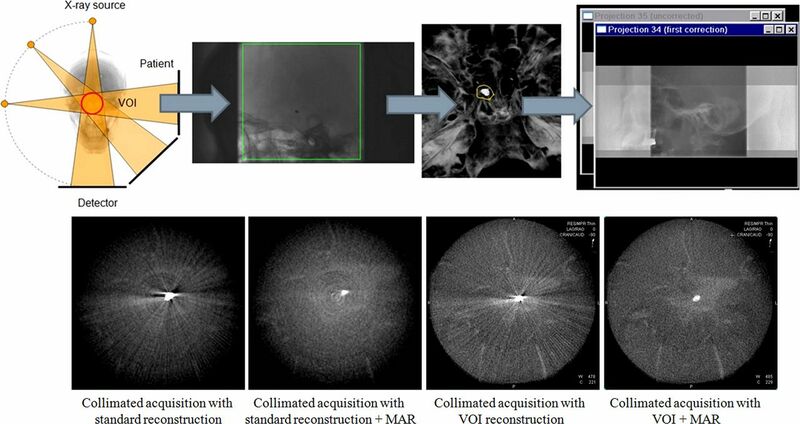 This work evaluates the feasibility and clinical value of volume of interest imaging combined with metal artifact reduction (VOI+MAR) to generate high quality 3D images with reduced radiation dose and metal artifacts. Material and methods Full volume (FV) and VOI scans were acquired in 25 patients with intracranial aneurysms and treated with either endovascular coiling (n=9) or stent assisted coiling (n=16) procedures. FV and VOI scans were reconstructed with conventional syngo DynaCT and VOI +MAR prototype software, respectively. Results Quantitative evaluation results demonstrated that compared with standard FV syngo DynaCT images, overall image quality was improved in the VOI+MAR reconstructed images, with streak metal artifacts considerably reduced or even removed; details of soft tissue in the vicinity of the metal devices was well preserved or recovered in the majority of cases. Radiation dose to patients calculated by dose area product was found to be significantly reduced using VOI scans. Conclusion This study confirmed the feasibility of using VOI+MAR prototype software to achieve high image quality of a small volume of clinical interest and to reduce radiation dose. This technique has potential to improve patient safety and treatment outcomes. For patients who undergo neurointerventional treatments, such as coiling and stenting, 3D reconstructed images help to deepen the understanding of the anatomical relationships between implanted metal devices and the surrounding vessels, and detect any possible complications, such as hemorrhage, facilitating more effective treatment outcomes. However, high density metal implants with high X-ray absorption significantly increase the gray values around them due to existing reconstruction algorithm limitations, and generate streak artifacts that obscure the surrounding structures. The image quality is degraded, and therefore diagnostic accuracy is reduced, which in the worst case may cause incorrect image evaluation and improper clinical diagnosis and decision making. In recent years, methods have been introduced to remove the metal artifacts. In particular, a novel metal artifact reduction (MAR) technique based on forward projection has been applied to CACT, and its clinical benefits in image quality improvement have been confirmed by a number of studies.14–17 With this method, a volume is regularly reconstructed (primary reconstruction) from the original projections. In this primary reconstruction, metal regions displayed as high intensity are identified and delineated. Next, the delineated volumetric metal regions are forward projected to obtain a set of artificial projection images. Subsequently, in the original projection images, the regions with metal contributions are replaced by projection values interpolated from the surrounding image data. Finally, a new reconstruction is generated by filtered back projection and the metal implants are reinserted into this MAR corrected volume. Here we tested the utility of the recently proposed combined VOI+MAR prototype, which is aimed at combining the advantages of both VOI and MAR.18 The feasibility of generating high quality 3D images of a region with a metal object and with both lateral and axial X-ray beam collimation using the combined prototype has been evaluated in the context of reducing metal artifacts while minimizing patient dose. Moreover, the potential clinical value of the combined prototype in neurointerventional treatment procedures is explored. From August 2015 to June 2016, 25 patients with intracranial aneurysms treated with either endovascular coiling (group 1, 9 cases) or stent assisted coiling (group 2, 16 cases) procedures were consecutively recruited. All patients had been examined by non-contrast enhanced CT (Aquilion One 640, Toshiba Medical Systems, Nasu, Japan) or 20 s acquisition based syngo DynaCT (Artis zeego, Siemens Healthcare, GmbH, Forchheim, Germany) as the pre-procedural diagnosis. Post-procedural FV syngo DynaCT was performed to evaluate the treatment results. In addition, bilaterally collimated VOI scans were acquired directly afterwards with the focus on lesion and implanted devices. Detailed patient diagnostic and treatment information is listed in table 1. The study was approved by the hospital ethics committee, and written informed consent was obtained from all patients. Both FV and collimated VOI scans were performed immediately for each case after placement of the metal devices. For FV scans, the entire brain was included in the field of view during iso-centering. For VOI scans, metal devices were iso-centered, and the X-ray beam was collimated both axially and laterally to approximately 30% of the FV size (30×40 cm detector) using a square collimator, which blocked the X-ray beam outside the VOI. During the 3D acquisitions, the C arm rotated for 200 degrees in 20 s, and acquired 496 frames in total. The acquisition parameters were tube voltage 70 kV, angle increment 0.4°, and magnification at 48 cm. The two sets of raw projection images were then transferred to an offline research workstation (syngo Multi-modality Workplace, Siemens Healthcare, GmbH, Forchheim, Germany) for post processing. The FV scans were reconstructed using commercially available syngo DynaCT software with the following reconstruction parameters: VOI size, full; slice matrix, 512×512; voxel size, 0.49 mm; kernel type, HU; reconstruction mode ‘native fill’; and image characteristics: normal. The collimated VOI scans were reconstructed using VOI+MAR prototype software, which is based on the 2D ATRACT algorithm, with an integrated MAR algorithm . A cylindrical sub-volume located in the center of the non-collimated region is reconstructed. The workflow is described in figure 1 (upper panel). First, the VOI size of the reconstruction is manually adjusted to only cover the non-collimated region. Image characteristic is selected as ’normal'. User interaction was required during reconstruction for metal delineation. Since coils were the main contribution to metal artifacts, even in cases where a stent was present, coils were considered as the only metal object. Window width/window center adjustments and volume cropping were performed to have only the metal left in the volume rendered window. Next, reconstruction continued until the resulting images were generated. In figure 1 (lower panel), the effects of applying MAR, VOI, and VOI+MAR, respectively, are illustrated, and compared with standard reconstruction for a collimated acquisition. Illustration of volume of interest imaging combined with metal artifact reduction (VOI+MAR) reconstruction workflow (upper panel). The effects of MAR, VOI, and VOI+MAR are compared with standard reconstruction for a collimated acquisition (lower panel). The quality of the FV and VOI+MAR images were displayed in three multi-planar reformation windows (axial, coronal, and sagittal) and one volume rendered window. Diagnostic confidence was independently evaluated by three experienced reviewers (physicians with more than 8 years of clinical experience). The overall image quality, diagnostic value for the ability to evaluate metal implants for aneurysm embolization, and the ability to evaluate surrounding tissue or hemorrhage were assessed using a 3 point rating scale, where class 3=excellent for evaluation, with almost no metal artifacts, class 2=sufficient for evaluation with acceptable metal artifacts, and class 1=insufficient for evaluation with severe metal artifacts. Variables are expressed as mean±SD, and evaluated using the Student’s t test. A P value <0.05 was considered to indicate a significant difference. Radiation dose to patients using dose area product was reported and compared. For all recruited patients, FV and VOI scans were successfully acquired after coil or stent assisted coil placement and volumetric images were generated using standard syngo DynaCT software and VOI+MAR prototype software, respectively. Compared with standard FV syngo DynaCT images, in the VOI+MAR reconstructed images, the streak metal artifacts were considerably reduced or even removed in the majority of cases. The image correction only reduced artifacts arising from metal object and there was no visible degradation of soft tissue in the vicinity of the metal devices. No case presented with more severe artifacts or degraded image quality after VOI+MAR reconstruction. For every patient in each group, overall image quality was rated as superior tothe metal artefact corrupted FV syngo DynaCT using VOI+MAR reconstruction, and the average rating improved by at least 1 point in 20 cases (1.36±0.483 vs 2.56±0.499, P<0.001). The effect of VOI+MAR reconstruction was even more evidently reflected by the substantially enhanced ability to evaluate metal implants for aneurysm embolization in all cases (1.187±0.392 vs 2.813±0.392, P<0.001). Also, using VOI+MAR reconstruction, the diagnostic value for identifying surrounding tissue and hemorrhage was rated superior in 21 patients (1.307±0.464 vs 2.227±0.535, P<0.001). Detailed results of the reviewers based on each group are summarized in table 2. Radiation dose to patients, calculated by dose area product, was 8835.1±563.2 µGym2 for FV acquisitions and was reduced to 2803.1±212.3 µGym2 for VOI acquisitions. This patient had a ruptured aneurysm at the upper segment of the basilar artery (figure 2A). On the diagnostic CT images, subarachnoid hemorrhage was detected as a high density region in the suprasellar cistern (figure 2B). This aneurysm was treated by coil embolization. Pre- and post-treatment DSA showed the size and location of the aneurysm and then coils were densely packed into aneurysm sac (figure 2C, 2D). Immediately after treatment, FV and collimated VOI scans were acquired and reconstructed. In the axial planes of the multi-planar reformation image, the FV syngo DynaCT showed strong artifacts caused by the coil package across the entire image domain, and the surroundings of the coils are masked by artifacts (figure 2E). The VOI+MAR reconstructed images focus on a smaller region of the brain, including the coils, with almost no artifacts (figure 2F). Thus the circumscribed hemorrhage in the close vicinity of the aneurysm can be recognized as it was before the coiling procedure. In the maximum intensity projection (thickness 12 mm) image, the streaking artifacts extended from the 3D coil package, which can hardly be delineated in the syngo FV DynaCT image (figure 2G), while the VOI+MAR reconstructed image demonstrated more precise definition of the coil package (figure 2H). The dose for the FV scan was 8403.5µGym2 and for the VOI scan was 2673.4 µGym2. This patient had a wide neck aneurysm at the basilar artery, with blood flowing into the aneurysm from both sides of the vertebral arteries (figure 3A). Brain hemorrhage was not detected from diagnostic CT (figure 3B). Pretreatment DSA showed the aneurysm and its parent vessel (figure 3C). Post-treatment DSA showed the performed stent assisted coiling via the right vertebral artery (figure 3D) by placing a stent (Enterprise, Codman, USA) across the aneurysm neck, followed by embolization with five coils into the aneurysm sac. Aneurysm stent assisted coiling example case. In the axial plane of the FV syngo DynaCT images, extensive metal artifacts partially obscured visualization of the adjacent stent and limited the evaluation of the surrounding tissue (figure 3E); in the VOI +MAR reconstructed image, dark and light streak artifacts were efficiently suppressed, with only a small amount of streaks remaining (figure 3F). The stent details can be better visualized in the maximum intensity projection image. Compared with the FV syngo DynaCT image (figure 3G) where the stent was severely contaminated by metal artifacts generated from adjacent coils, stent deployment, stent struts apposition to the arterial wall, coil herniation into the parent artery, surrounding tissue, and any anatomical structures were clearly revealed for clinical evaluation in the VOI+MAR reconstructed image (figure 3H). The dose for the FV scan was 8441.9 µGym2 and for the VOI scan was 2762.4 µGym2. CACT has been used widely to provide image results for patients with neurovascular diseases and undergoing interventional treatments. In many clinical scenarios, only a small portion of the entire brain, including lesions and implanted metal devices, is of diagnostic interest. Three-dimensional FV scans of the entire brain do not have added clinical value can cause unnecessary large X-ray doses to patients. Also, in the presence of coils, obscuring streaking metal artifacts are introduced into the reconstructed 3D images, causing deterioration in image quality and making interpretation of the image and proper clinical diagnosis difficult. Here we have demonstrated the value of using VOI+MAR prototype software for 3D reconstruction of a small volume with intracranial metal devices (ie, coils). Patients with intracranial aneurysm coiling and stent assisted coiling treatment procedures were successfully evaluated. First, the X-ray beam was collimated to a smaller region but still sufficiently covered regions of clinical interest. The radiation dose to patients was reduced to approximately one-third of the FV scan. Important image information and characteristics were well preserved, without visible truncation artifacts introduced. In addition, for all cases, metal artifacts contributed mainly by coils were substantially reduced, if not completely removed. Even for aneurysms with dense coil packing, which was likely to cause the most severe artifacts, satisfactory results were obtained with VOI+MAR reconstruction. Surrounding bone structures, brain parenchyma, and hemorrhage could be clearly observed, with similar image quality as diagnostic CT or syngo DynaCT acquired prior to the treatment, which were free of metal artifacts. In most cases, the stent, the stent struts structure, stent deployment with respect to the arterial lumen, and stent narrowing due to coil protrusion were clearly revealed, which were strongly obscured by the metal artifact. Statistical results confirmed that overall image quality and diagnostic value of the VOI+MAR reconstructed images were increased compared with conventional syngo DynaCT reconstruction corrupted by metal artefact. With these advantages, VOI+MAR reconstruction enables delineation of anatomical structures important for diagnosis, assists in image guided interventional procedures, and checks outcomes during follow-up examinations with minimal radiation dose to the patient. If multiple 3D acquisitions are necessary to carefully monitor the progress of complicated interventional cases, this technique effectively avoids extensive X-ray radiation exposure to regions outside the clinical volume of interest. Potential clinical applications include, for example, timely rebleeding detection, assessment of the relationships of different implants, malpositioning, fracture, incomplete deployment, apposition to the arterial wall of stents and flow diverters, and coil protrusion into the arterial lumen. Limitations of this work should be mentioned. First, with the absence of data in the X-ray projections caused by metal implants, artifacts still appeared in the close vicinity of densely packed coils in a number of cases, thus making aneurysm neck evaluation difficult after coil embolization. Second, in the stent assisted coiling cases at the posterior cranial fossa, although it can be observed that overall image quality was improved using VOI+MAR, with remarkably reduced metal artifacts, due to the density of the stent struts and the adjacent bones, visualization of the stent was not enhanced and, therefore, diagnostic value was not improved. Third, the size of the VOI being required for assessment of the treatment should be carefully considered when selecting the collimation setting for VOI imaging, during which the implanted device has to be iso-centered under fluoroscopy, which can be technically challenging for a small field of view. Lastly, the number of patients and clinical scenarios in this study were small, which preliminarily demonstrated the feasibility of the method used. In future, patients treated with, for example, flow diverters, clips, and Onyx, should also be included in a more comprehensive study. This study confirmed the feasibility of VOI+MAR prototype software to improve image quality and reduce radiation dose to the patient. This technique has the potential to enable accurate evaluation based on 3D images during the course of interventions and follow-up examinations, leading to improved treatment monitoring and patient safety.
. Three-dimensional imaging and cone beam volume CT in C-arm angiography with flat panel detector. Diagn Interv Radiol 2005;11:10–13.
. The utility of DynaCT in neuroendovascular procedures. AJNR Am J Neuroradiol 2006;27:330–2.
. Medical image reconstruction: a conceptual tutorial. 1st edn. Berlin: Springer, 2010.
. Region-of-interest reconstruction on medical C-arms with the ATRACT algorithm: Proceedings of SPIE, 2012. Contributors Guarantor of integrity of the entire study: ZQ, XR, SQ, and MG. Study concepts and design: ZQ, ZH, HJ, SQ, XR, and MG. Literature research: ZQ, HJ, SQ, and ZH. Clinical studies: ZQ, HJ, ZH, PW, ST, and GC. Experimental studies/data analysis: ZQ, ZH, PW, ST, and GC. Statistical analysis: ZQ, ZH, SQ, and HJ. Manuscript preparation: ZQ, ZH, and SQ. Manuscript editing: ZQ, XR, SQ, and MG.
Ethics approval The study was approved by the Military General Hospital of Beijing PLA.